We have put together this dog years calculator because we get asked quite often how to work out dog age in human years. Interestingly, the old adage that one human year equals seven dog years, has now been found to be incorrect. We can now be far more precise in working out a dogs age in human years and we now take into account a dogs size. We can also now say that dogs mature at a very different rate to humans. In fact the first two years of a dogs life is calculated to be equivalent to twenty two years in human terms. But, after their first year or two of life, a dog will grow at a slower rate. Before using our calculator it should be remembered that not all breeds have a uniform life span. 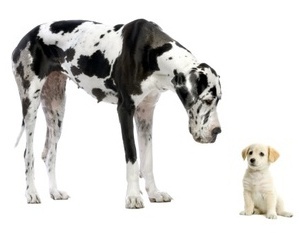 Larger breeds tend to live shorter lives, for example a Labrador may have a life expectancy of 10 to 12 years, a Great Dane 8 to 10 years whilst a small terrier could be expected to live 14 to 16 years. Of course all those figures are generalisations but nevertheless the trends are accurate. It should also be remembered that mixed breeds tend to live longer than pedigree dogs. To find out your dog age in human years, use the calculator below. You can determine the human age based on dog years, or dog years based on human age.